After my Mexican mountain getaway, I've been continuing with the hiking that got started at Rancho La Puerta. Luckily our local weather has continued to be pretty nice ... allowing JJ and I to hike our beautiful area. 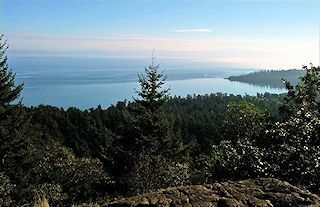 A favorite is a local park called Mount Doug (to the Coast Salish people its Pkols ... much more fitting than the Colonial Governor sticking his name on!). JJ now has a frequent visitor at the office ... Bandit! 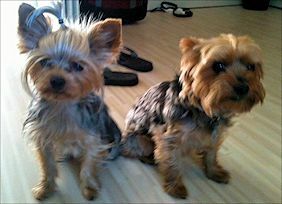 The Law of Attraction works pretty strongly here with Yorkies, not only does Stasi have Bandit, but Jane (who helps out on Mondays) has some too! JJ has short hair now, which will be easier for when Victoria's rainy season hits (FYI, it's NOT fun walking a shivering 3 lb dog when it pours!). I used to think it was goofy when people dressed their small dogs ... now I know why they do it, it's needed! On the work front, our fall semester of classes has begun. SHIFT-IT Online kicked off recently (you can still join in if you like), plus Fundamentals of Interactive-Visuals (Online Version) starts October 21st. Occasionally you'll see or hear Yorkies in the background! Enjoy your remaining days of summer (if you are Northern Hemisphere). See you in our upcoming fall or 2014 classes! P.S. For 2013-2014 course schedule, click here. Our 2013 Visual Coach Certification is nearing Exit Exam time. Part of their Exam Process requires live coaching of a Test Client through a map of the SHIFT-IT System® (by phone). Would you like to be a Test Client? It's a win-win for all (you get a Visual Coaching session at no charge and our coaches (all of whom are already skilled Process Professionals) get a client to demonstrate their proficiency with. To be added to our list of Test Clients, email Office Manager Stasi Manser at [email protected]. "WOW! USING VISUALS WITH MY CLIENTS HAS BEEN A GAME CHANGER ..."
"Being a Professional Coach already, I was a little unsure as to "what", exactly, I would gain from Visual Coach Certification ... until I dove in and went through the program. Being more "left brained" I was a little nervous about learning to use the visual tools. Wow! Using visuals with my clients has been a GAME-CHANGER. I am SO grateful for your mentoring and tools. It's easy to learn (with practice, practice, practice) and, more importantly, to implement. I now use visuals on a regular basis with my clients. You are a patient, giving, articulate coach who has a unique gift of helping the motivated learn things that are outside of their usual comfort zone. Your classes and resources are useful, practical and challenging. Fundamentals of Interactive-Visuals was inspirational, to say the least. And THANK YOU for Biz Basics for Process Professionals. It's one thing to learn it, it's another thing to apply it in a practical way to a money making business. I cannot thank you enough." Ready to get what you want?! Only offered twice a year! Our signature coaching group - gets you what you next want in your personal and/or professional life. You develop a crystal clear vision, unravel your resistance ... and rapidly SHIFT your world. Practical real-world strategic planning coupled with leading-edge Law of Attraction wisdom --- all in our innovative 'Visual Coaching' style. Join this supportive community with other like-minded SHIFTers from across the globe, includes The The SHIFT-IT Home Retreat Kit® with 17 visual maps. Still Possible to Join In! * Note: Pre-requisite for Visual Coach Certification. FYI, Repeater Option available for those who have taken this program before and want to refresh. Over 87% of your facilitation, coaching, training and consulting clients are visual thinkers - learn powerful visual skills to boost the effectiveness of how you work with them. 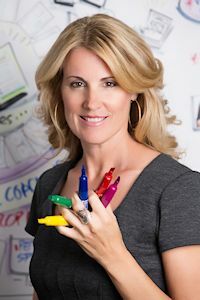 This professional skills training (fully online) thoroughly covers custom chart work, visual recording, visual facilitation and visual coaching (the four main applications of working visually with groups and individuals) so you can add these powerful tools to your own process toolkit. This is the online version of our popular 3-day fundamentals training (no travel required). FYI, Repeater Option available for those who have taken this program before and want to refresh. For coaches, therapists and other Process Professionals who work with individuals, couples or personal growth groups. This one-of-a-kind experience teaches you how to work visually with your clients and licenses you in our SHIFT-IT System® 17 visual maps as complete process or piecemeal). Join our amazing international cohort of Certified Visual Coaches® and add the power of Visual Coaching to your own practice. *** Two Pre-requisites: Fundamentals of Interactive-Visuals and SHIFT-IT Online (or equivalent experience). Want to successfully integrate the visual way of working into your own Professional Practice? Ready to SHIFT your work and/or life for the better? Christina Merkley has limited availability for private visual skills apprenticeships and biz/life coaching customized to your unique situation. Excellent if you desire a fast SHIFT or prefer customized, premium attention. *Exploratory Chat with Christina to discuss your goals and determine which package best for you. Email [email protected] to book. Note: This article is the second in a 3-part series. The first article explained how Authors, Speakers and Trainers can use Interactive-Visuals to better their work . In today's article, the second in the series, I'll explain how Organizational Leaders, Consultants and Facilitators most commonly use the visual approach. And in an upcoming third article, I'll explain how Interactive-Visuals are used effectively in coaching, therapy, counseling and other personal development work (a topic close to my heart). Depending on the nature of your Process Practice you may use one, several, or all of the approaches. I have covered these four applications in another article, so I won't duplicate myself again here. Rather, in this new series of articles, I'll explain which types of professionals tend to use which applications and why. (if you aren't familiar with the four ways of working, you'll want to read that article first). One arena where Interactive-Visuals is used very successfully is in the organizational world. By being strategically used by organizational leaders and the employees, consultants and facilitators who are engaged within companies - often focused on organizational change and its implementation and management. 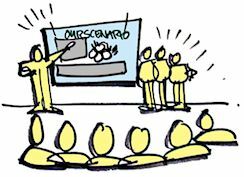 If the leadership is already clear about the changes their organization needs to go through, and the ways that the change will be implemented and managed ... then handy custom visual materials can be created in partnership with an Interactive-Visuals specialist to effectively communicate the intended journey and outcomes. These materials can be created in a whole slew of different forms and formats, depending on what would best serve the particulars of the situation (i.e. large size murals, smaller size charts and printouts, digital & web versions (with or without embedded multi-media, explainer videos, etc ... for more information see "Custom Chartwork" section of the 4 Main Ways of Working article). 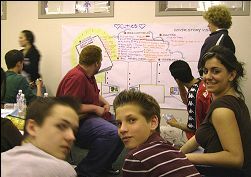 If the organization does not yet have a clear story, plan or messaging ... then other Interactive-Visual methods can be used either by internal staff or external contractors to get the story, plan and messages clearly defined and articulated (then cascaded throughout the organization so everyone understands and implements their role in the Big Picture). The most effective visual method for this type of clarity, communication and implementation work is true Graphic Facilitation (some also call it Visual Facilitation). I say 'true' because there is currently A LOT of misunderstanding about this term in the visual community and in the client base who hire us. Many are mixing this term up with Graphic Recording (also called Visual Recording, Scribing or Sketchnotes) its more passive/benign cousin where visual notes are taken off to the side with little or no interaction with the participants. True Graphic Facilitation is where the visual methodology is fully integrated into the meeting process (not just a cute, entertaining, artsy thing done off on the side). True Graphic Facilitation is not particularly neat, tidy or pretty. Instead it is in-the-moment, co-created, roll-up-your-sleeves, messy, functional ... its all about wrestling and teasing the wisdom out of groups in real time (if you want it pretty ... you take that hard won content and tidy it up later in Custom Chartwork or videos, etc.). 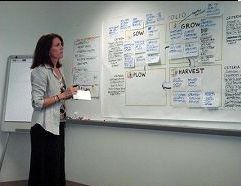 For more info on Graphic Facilitation, see 4 Main Ways of Working Visually article. In the earlier years of my career, I was employed by David Sibbet via his company The Grove Consultants in San Francisco. Its wonderful to see David getting well deserved recognition for his pioneering work in true Graphic Facilitation (via his popular Visual Book series by Wiley Press). FYI, for you internal change agents and/or outside contractors who facilitate --- The Grove produces a whole series of Visual Facilitation products that are excellent. I direct you most specifically to their suite of Graphic Guides (back in grad school I helped write some of these while on an internship). Note: I have been a long-time associate of The Grove since I created my own company in 2001. Use my last name "Merkley" to receive 15% off most products. ... brainstorming/idea generation, history & life mapping, visioning, strategic planning & action plans, conflict resolution/mediation techniques, succession planning, entrepreneur/partner discussions, family councils, world cafes, dialogue circles, value proposition work, values & mission/vision clarification, product development, process mapping, etc. etc. etc. 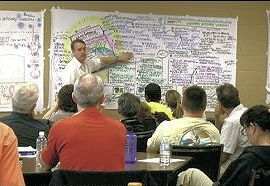 Basically any group gathering where people come together to talk and sort things out can benefit from proper application of Visual Facilitation methods. 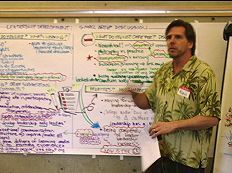 As you can see, Interactive-Visuals gives Organizational Leaders, Consultants and Facilitators some wonderful tools in which to more effectively engage their companies and clients. Next issue, I'll continue with Part 3 of this series ... how Coaches, Therapists and Other Helping Professionals can benefit from the use of Interactive-Visuals. Blog Comments: Thoughts? Reactions? Have something to add? Click here to leave comments and read those left by others. In the scheme of things, life is short. It's a shame not to live it in alignment with who you truly are. We have successfully SHIFTed to a life of authenticity, creativity and abundance that is aligned with who we truly are. Let us assist you in doing the same via private mentorship. We specialize in individuals who need to get their 'special it' into the world (entrepreneurs, biz owners, team leaders, teachers, consultants, facilitators, trainers, coaches, therapists, visual practitioners, etc.). We coach you to build/enhance your internal or external practice or small business (including identity/brand, biz basics, creation of effective offerings, necessary systems (tech and socio) and marketing & sales). As well as having a satisfying personal life of supportive family, friends and community. Stop splitting your energy - create a congruent life that truly works for you! Are you a process professional with a creative bend? Are you intrigued with the visual way we work with our clients? We've trained hundreds of facilitators, consultants, trainers and now coaches, counselors, social workers, etc from around the globe. Learn fundamental visual skills that you can use in your own work with groups and individuals. Come join the visual tribe! 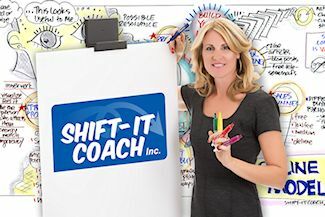 SHIFT-IT Coach, Inc. is a boutique training and coaching company specializing in visual process work for groups and individuals. Founded by Christina Merkley, pioneering Visual Facilitator and Coach, we work deeply with individuals, partners and conscious businesses to define and manifest what you really want. We also train Process Professionals from across the globe in our innovative ways of working. For more information visit www.shift-it-coach.com and www.visualcoaches.com. Click here to read the SHIFT-IT Coach blog. Copyright © 2004-2013 Christina L. Merkley. All rights reserved.